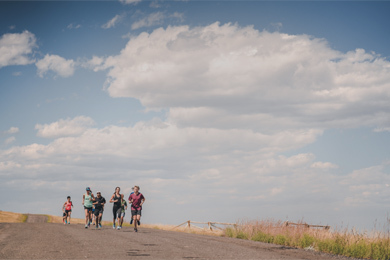 At Saucony, we live and breathe running. Every runner is unique and we aim to design top of the line shoes for a flawless fit. Let’s find your perfect pair. What is your cushion comfort level? Cushioning protects you by absorbing impact. How much you need depends on how you run. What type of stability are you most comfortable with? Some runners need shoes with additional stability to reduce stress caused by their ankles rolling in. How does your foot strike the ground? Toes First: If you land toe first then you don't need added heel cushioning. Very few (5%) runners land Toe First. Flat: If you land with a flat foot then you may not need as much heel cushioning. Some (15%) runners land with a Flat Foot. Heel First: If you land heel first, then you probably need plenty of cushioning under your heel. Most (80%) runners land Heel First. Our running shoes are built with two different levels of "offset" which is the difference in the thickness of the heel of the shoe vs the thickness of the forefoot of the shoe (the "ball" of your foot). Shoes with 8mm offset have proportionally more cushioning in the heel compared to the forefoot than 4 mm. So 8mm may work better for runners who land with a heavier heel strike. Shoes with 4mm offset work better for runners who land with a more midfoot strike, where the heel and forefoot land close to the same time.